In the wake of a very bad month for religious tolerance in the US — including the shootings at the Sikh temple in Wisconsin; the burning of a Mosque in Joplin, Missouri; and the insinuations about Muslim infiltration of government by a handful of Members of Congress, later denounced by some of their counterparts — religious diversity has been on my mind. And, as I often do when I want to make at least a little more sense of the world, I went looking for data. What I came up with included data on religious adherence across the county (from the Association of Religion Data Archives), data on religiously-motivated hate crimes (from the FBI), and data on the demographics of religious adherents (Pew’s U.S. Religious Landscape Survey). Here’s a data point that will not surprise you (based on the 2010 U.S. Religious Census: Religious Congregations & Membership Study): among religious adherents in Virginia, Evangelical Protestant denominations claim the most members, with 43% of church members belonging to an Evangelical denomination. Mainline Protestants make up another 24% of Virginia’s religious adherents, and Catholics compose 19%. But the majority of Virginia’s population is unaffiliated with any religious institution– 55%. They aren’t necessarily a-religious, but are not counted as members of a religious institution. * So the Virginia population as a whole is comprised of 19% Evangelical Protestants, 11% Mainline Protestants, and 8% Catholics. Another 5% are scattered among a variety of religious congregations (Jewish, Muslim, Hindu, Unitarian, Buddhist, to name but a few). These are the religious minorities. Religious minorities are the primary target of religiously motivated hate crimes (the majority of religiously-motivated hate crimes are directed at Jews). Virginia officially recorded only 27 religiously-motivated hate crimes in 2011 (from the Virginia State Police’s Crime in Virginia series); actually, the number has been at 27 for three years straight. On the one hand, this represents fewer incidences than in the prior decade, graphed below. 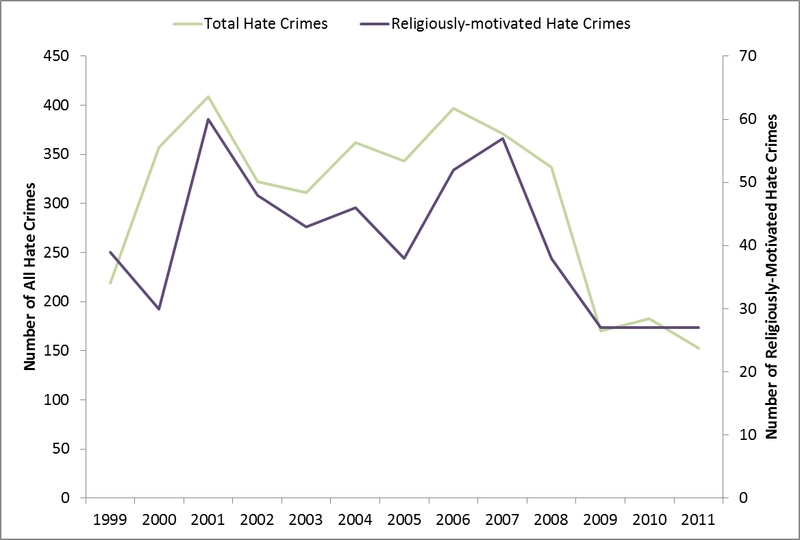 The number spiked in 2001, when then number of hate crimes directed at Muslims peaked and again in 2007. So the current reduction is all to the good, and mirrors a drop in all categories of hate crimes in the state (based on race, ethnicity, sexual orientation, and disability, in addition to religion). On the other hand, in 2010 and 2011, there are 35 recorded instances of religiously-motivated vandalism, 13 recorded cases of religiously-motivated assault, 5 cases of burglary or larceny, and 1 case of arson. Perhaps this is minimal – though the Bureau of Justice Statistics estimates that less than half of hate crimes are reported to the police, based on their National Crime Victimization Survey – but the persistent intimidation of others based on their religious practice remains troubling. It’s hard to predict when the violence will erupt. To see where Virginia’s religious minorities were, if they were clustered anywhere in particular, I mapped the percent of religious minorities based on the ARDA data. Plus, I added height to areas with reported hate crimes in 2010 (the most recent year in which I could get data by locality from the FBI report). In only a handful of places do religious minorities make up more than 10% of the population, and there’s no clear pattern. Hate crimes are most often reported in highly populated areas, and mostly in places where religious minorities make up between 3 and 7 percent of the population. I can only hope for the continued decline of crimes against those who worship differently (as well as the decline against all whose perceived difference makes them targets). Though the continued poor opinion some Americans express toward religious minorities, like Muslims, doesn’t augur especially well. How does this look across the rest of the country? I’m working on another post incorporating national data, so stay tuned. *The Pew Forum on Religion and Public Life estimates only 18% of Virginians are unaffiliated. They derive their estimates based on a survey of Americans — for Virginia, this includes 997 cases — and respondent’s self-reported religious identification, apart from church membership or attendance. The 2010 U.S. Religious Census uses membership data from churches themselves. Neither is perfect, but the survey questions encourage people to identify with a tradition (e.g., if respondents answer “Something else” to the question “What is your present religion, if any?” they are subsequently asked “Do you think of yourself as Christian?”), and will necessarily pick up a segment of non-attending folks who nonetheless consider themselves to be loosely affiliated with some religious tradition.